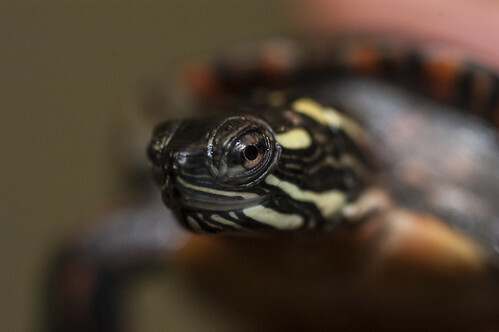 Midland painted turtles are named for the brightly colored markings on their faces and limbs. Individual turtles range from 3-10 inches in length. Their yellow-and-green shells are relatively flat. Southern Canada to northern Mexico. 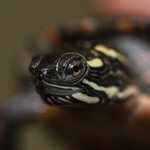 Midland painted turtles are one of the most common turtles in North America. The species favors still, shallow freshwater habitats that have a thick layer of mud beneath the water. 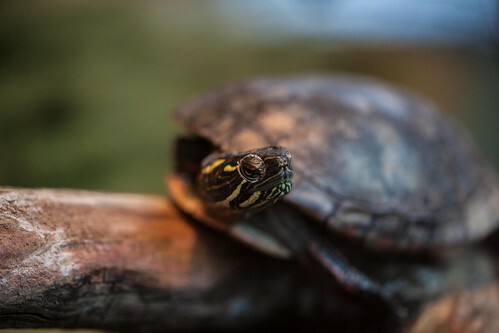 Midland painted turtles often spend winter burrowed in mud beneath the pond surface, entering a state of lowered activity to survive the cold weather. They mate upon becoming active again in spring. Females lay 4-15 eggs in a sandy hole excavated for that purpose. The sexes of the hatchlings are dependent on temperature during incubation; low temperatures result in males and high temperatures result in females. The young dig themselves out after hatching and are immediately independent. 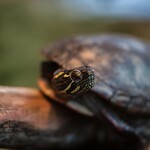 The Midland painted turtle is able to defend itself against predators by withdrawing its head and limbs within its shell.